It has been built around 1270 on behalf of the Count of Vianden (Luxembourg) who had been inspired by the Château fort du Louvre in Paris. It aimed to defend the duchy of Brabant against the neighbouring hostile county of Namur. Now it is recognized as one of the “major heritages of Wallonia”, “being the most important and most complete witness of the 13th century”. By the way, the village of Corroy-le-Chateau has been merged in the 1970ies with the neighboring commune of Gembloux (25.000 inh), a commune which belongs to the Province of Namur. During our guided visit of the castle we’ll see its impressive inner court, admire some iconic rooms and hear more about its fascinating history. The castle has never been sold: it has been transmitted from family to family through marriage. It belonged to the Trazegnies family since the XIXth century. The present Marquess Olivier de Trazegnies is a remarkable personality: he is still living in the castle which he now manages together with the well-known Association des “Demeures Historiques de Belgique” which recently became the 99% owner . The Marquess is an historian (he wrote “Le lis et le sanglier”), and member of Europa Nostra. He wrote a detective story (La présence de l’ombre) and he always represents the Emperor Charles V on horse back in the famous Ommegang pageant held in Brussels. 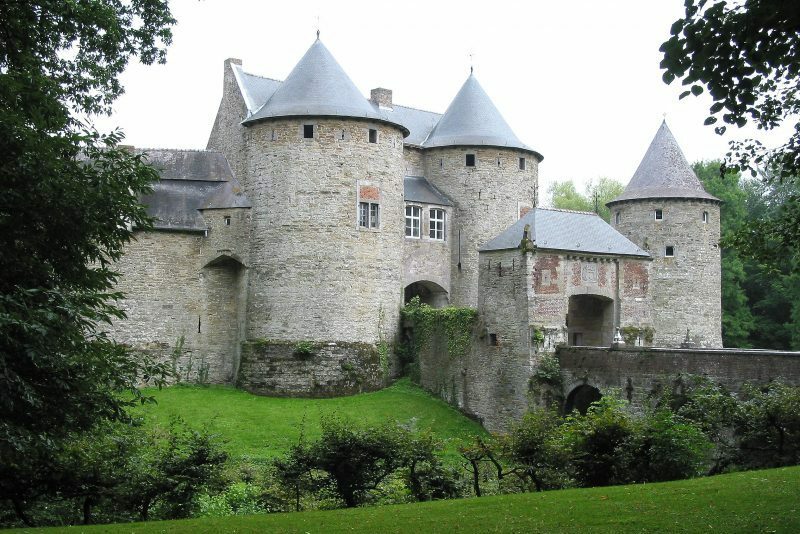 As a matter of fact, one of his ancestors was chamberlain of Charles V.
After lunch in Gembloux we’ll pay a guided visit to the Moulin Defrenne in Grand- Leez, a small village which has also been merged with Gembloux in the 1970ies. The windmill Defrenne has in fact a remarkable history: it was erected in 1830, indeed the year of Belgium’s independence and it always belonged to the same family. Presently it ‘s the fifth generation in charge of this unique building. Throughout the years the mill has been adapted to the successive sources of energy (steam, oil, electricity). But it still can use the wind if the weather is favorable. The miller himself will tell us more about this and how to get proper bread with pure wheaten flour. Seize this opportunity to become better informed in this vital field! and get a true “pain de campagne”. Lunch including two courses, drink and coffee, at Hotel Brasserie 3 Clés, at the roundabout in Gembloux.